The present box is unusually large for its type. As suggested by the shou characters, it was probably a container for a set of jade tablet-form books specifically commissioned for a birthday celebration. 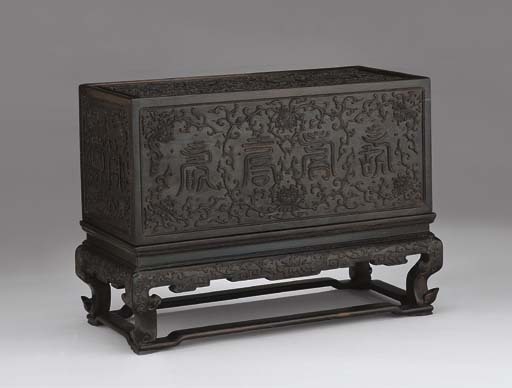 For other boxes, see Qing Legacies: the Sumptuous Art of Imperial Packaging, Macau Museum of Art, 2000, p. 77, no. 9, p. 138, no. 51 and p. 140, no. 52; each of cloisonne enamel, gilt-metal embellished with glass, and sandalwood respectively.